Tree Country Bistro is just down the street from me, and I had no idea it was there for almost a year. That was a real shame, but I’m making up for lost time. Right in the heart of Coventry, this tiny little restaurant is an Asian food haven. Tree Country Bistro offers a large variety of menu selections ranging from Japanese entrees and sushi to Korean such as Bi Bim Bab and traditional Thai curries. Located so close to Pacific East I never thought to go to Tree Country Bistro for sushi, but their sushi is equally fresh and delicious. 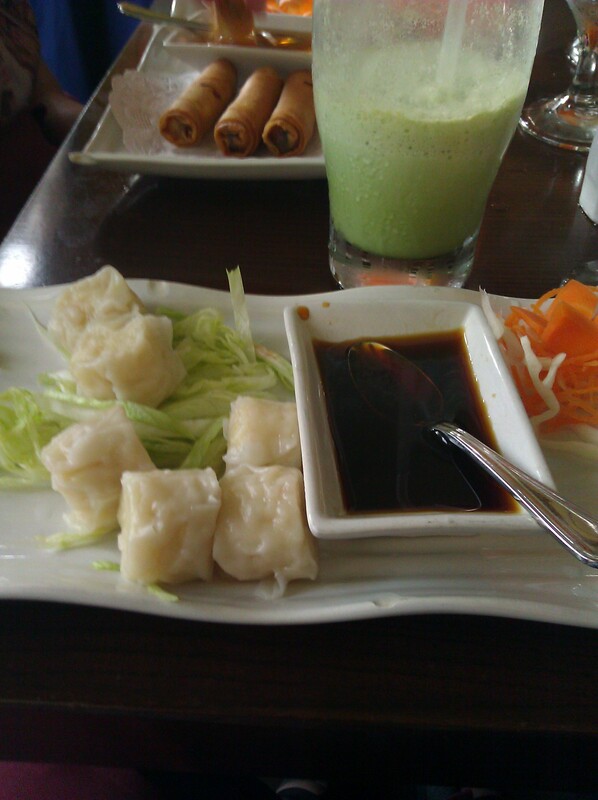 When I order sushi for delivery, Tree Country Bistro is my first choice, because they offer a wide selection of sushi and some other warm appetizers like shumai (steamed or fried shrimp dumplings with a soy ginger sauce – I prefer them steamed as in this photo). You can’t go wrong with the spring rolls (as seen in the top photo behind my melon smoothie) or the gyoza (pork dumplings), but if you want to try something different I highly recommend you try the soft shell crab tempura as an appetizer. 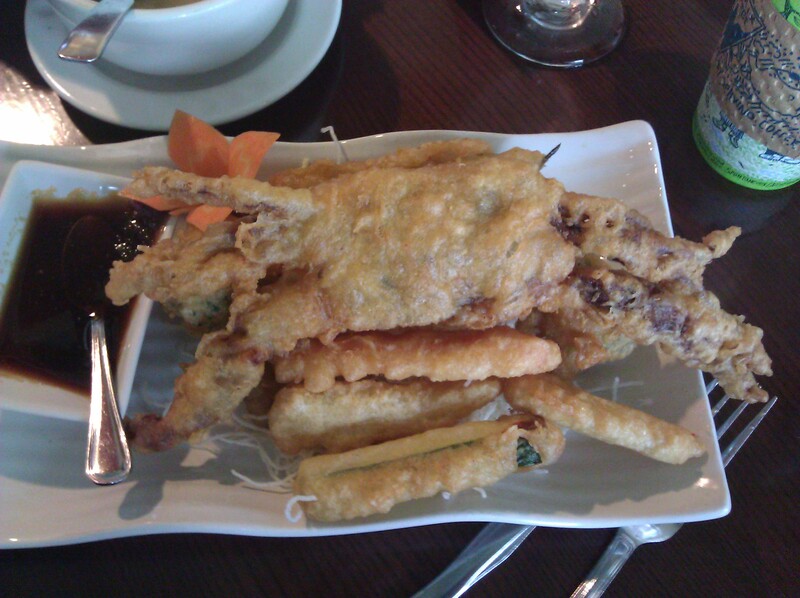 The dish features lightly breaded and perfectly fried soft shell crab and vegetables with a light dipping sauce. Wow! Talk about different and delicious! 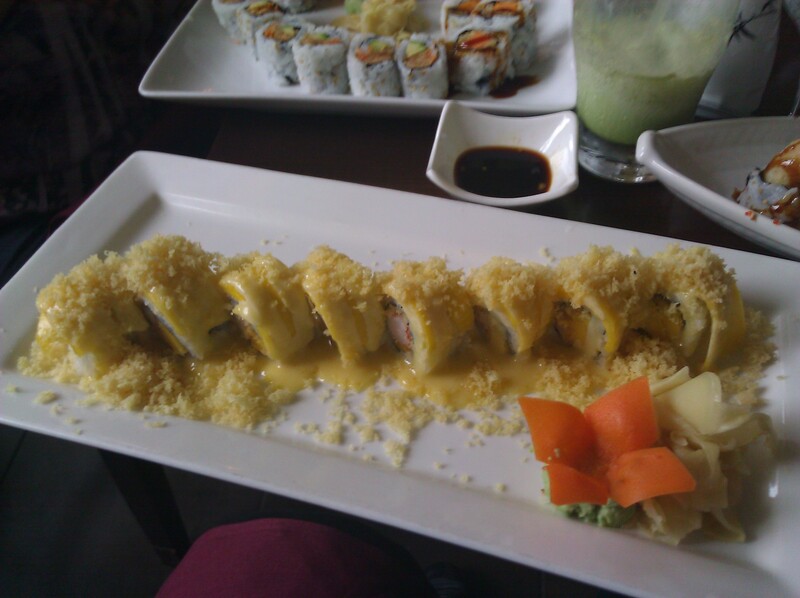 My favorite roll is their Ebi Mango Maki, which features cooked shrimp, fresh mango, tempura crumbs and a special sauce. The flavor is bright and delicious. The tempura crumbs were a nice contrast to the smoothness of the mango. If you prefer trying their Korean dishes you will also not be disappointed. Their Bulgogi and Bi BimBap are definite must-tries. Bulgogi is a Korean dish that usually consists of marinated barbecued beef, chicken or pork. It is listed at number 23 on the World’s 50 most delicious foods readers’ poll compiled by CNN Go in 2011. Bulgogi literally means “fire meat” and is made from thin slices of beef. Before cooking, the meat is marinated to enhance its flavor and tenderness with a mixture of soy sauce, sugar, sesame oil, garlic, pepper and other ingredients such as scallions, onions or mushrooms. 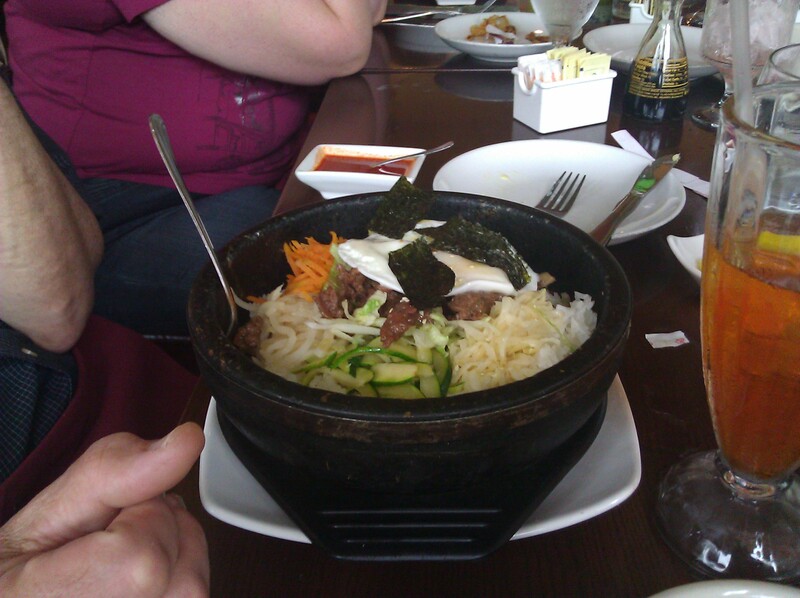 The day we ate there most of my friends ordered the various versions of BimBap, which features chicken or beef. It is made with bulgogi-style meat and deliciously marinated vegetables. 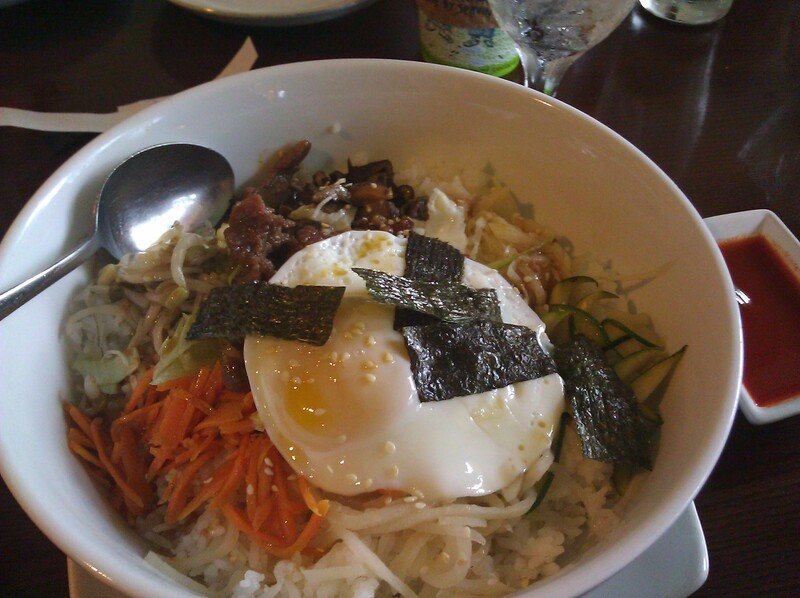 Tree Country Bistro serves their traditional BimBap with a cooked egg on top (see photo on left). They also serve Okdol Bi BimBap (on the right), which is served in a sizzling hot stone pot. Everyone loved their choices. The service was attentive (considering we were a large table and they had quite a few additional tables to take care of at the same time). Drinks were refilled, and the attention to detail in the food was really remarkable. 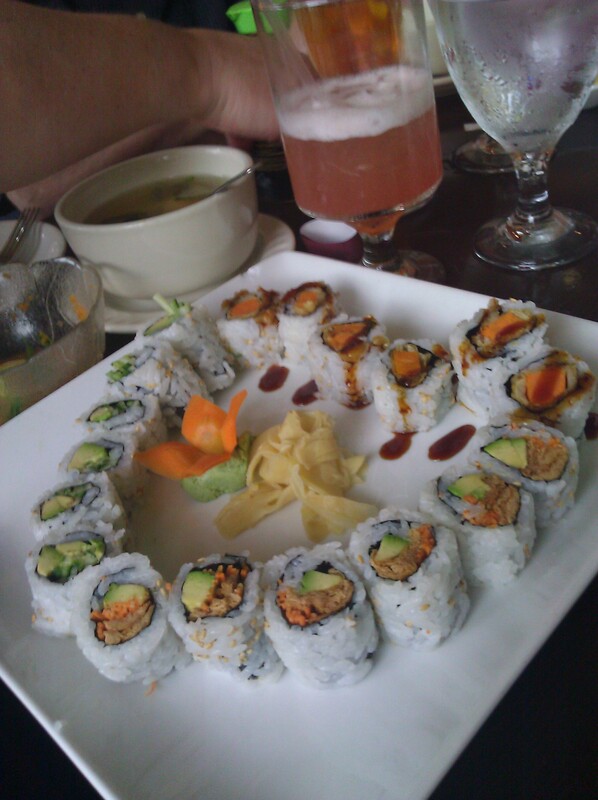 In fact, one of the plates of sushi was served in the shape of a heart, which was a cute touch. The owners brought out a beautifully cut plate of fresh fruit (watermelon, honeydew melon, grapes and orange slices topped with hand-carved carrot butterflies and flowers) for us on the house, which was a lovely surprise. Unfortunately my photo of it was blurry, so I can’t share it. It was the perfect ending to a delicious meal. The menu is understandably extensive. You can check it out by clicking on the restaurant name under Contact info. I’m confident everyone you dine with will be able to find something to satisfy them. Glad that you wrote about this. It’s on my 2012 To Dine list, selected by my readers. Haven’t made it there yet. Looks great!